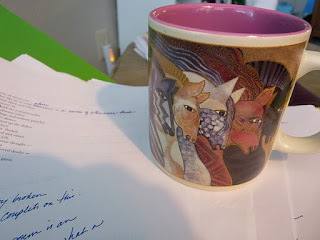 This morning in my journal writing -- and in an email to a friend -- I have indulged in a pity-party. Why write? What's the use? Will any of this work, this writing, ever be to any point? Will my poetry book and my novels ever find publishers? Does anyone believe in me, besides me? Do I still believe? Everyone who has ever discouraged me loomed up in my imagination and stood there (a mob of them) frowning sternly: "You're wasting your time!" "In order to write, you must face your inner critics, steal their power. Begin by trying to identify them. The more ambiguous they are, the more power they have. Write down: Who are they? What do they look like? Where do they work? At a university? At a magazine? How did they acquire so much power? When did they enter your life? In second grade, when your teacher threw your writing in the trash? In college, when your professor wrote huge X's all over the poems he didn't like? Last week, when you received four rejections in the mail? Describe them and what they're saying to you." Ultimately, to be an artist in this world -- where money and technology and politics compete to rule our lives -- you have to find one person to believe in and 100% support your peculiar vision. And that person is you. Yes, right, we must love ourselves first and of course love what we, ourselves, write. It feeds our souls and maybe one or two others and if we help only one other person in the world it's a good thing. On the PBS newshour last night a man, I can't remember from where, but one who reads books and chooses what is a winner and what is not - out of 300 a day or week or month - he chooses 15 to read. One he chose was the MARRIAGE PLOT and put it on the "best book list" I had read it and would never choose it. Maybe the best stories never ever get published. They end up with the tossed out 285 piles. I am printing out this comment and putting it in my notebook. Carolynne, you can be my official encourager. I'll be yours.